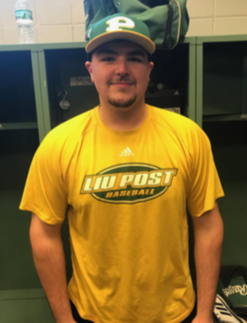 This week’s Athlete of the Week is Mike Manzione, a senior criminal justice major and infielder for the baseball team. Manzione is a returning starter for the team. After seeing little action his freshman and sophomore seasons, he made 38 starts as a designated hitter and at first base his junior year. At the end of the 2018 season, Manzione was named Second Team All-East Coast Conference for the first time in his collegiate career. He led the team’s home run statistics with seven home runs, tied for third on the team in runs, batted in with 28, and finished third on the team in batting average, batting .323. The baseball team made the East Coast Conference playoffs last season with the help of Manzione’s strong presence in the line-up. In May last year, Manzione had his best game of the season. Hitting two home runs and knocking in four runs against St. Thomas Aquinas. During the offseason, Manzione spent a lot of time in the batting cage, trying to get as many swings as possible to be ready for the start of the season. “I’m very excited to begin the new season and get back out there,” he said. Being a returning starter and senior on the team, many of the players see Manzione as one of the leaders. That applies, both on and off the field. “Mike Manzione is a great teammate. He’s a guy who cares about his teammates on and off the field and is hardworking,” sophomore pitcher Antonio Deodato said. Manzione is looking forward to this season. “We have a lot of expectations and potential this season. Since this is our last year in Division II, we really want to end it being a championship team,” he said. He hopes to improve on his play from last season and to help lead the team to a conference championship. The team is currently ranked ninth in the East Region of Division II baseball and second in the East Coast Conference behind St. Thomas Aquinas College. The baseball team’s first game is on Feb. 15 against Tampa University, in Tampa, Florida.